Crochet slip stitch is an incredibly useful stitch to know. It's often used as a way to join rounds of crochet, but it can also be used to embellish or "write" in stitches onto a crocheted background. When you work it as a joining stitch it is pretty much invisible, but when you use it as an embellishment in a contrast yarn, it looks like an embroidered "chain stitch". 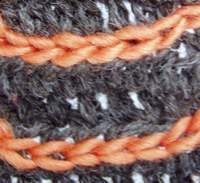 This stitch has no 'height' so you don't need to work any chains to raise the level of your work. Hold the ends to be joined side by side. Working as if you were just continuing along a row, push your hook into the first stitch of the left hand edge, yarn over and pull through to front then also pull through loop on hook. That's it - that's the stitch - you did it! Blink and you'll miss it! You joined one end of a row to the other using the crochet slip stitch. Now you would just follow the pattern you're using...some patterns call for you to just chain to the height of the next row and continue without turning, others may ask you to turn over your work and work back around again. This all depends on the designer who wrote the pattern. Now, on the other hand, if you want to use this stitch as an embellishment, there's a slightly different technique. For a start you'll be using a contrast yarn and working onto a crocheted or knitted backgound. With your contrast yarn held to the back of your background fabric and holding onto the tail of yarn, push your hook through your fabric from front to back, yarn over, pull hook through to front. This forms your first loop. *Move along one stitch and push your hook through your fabric from front to back, yarn over, pull hook through to front and through loop on hook. Repeat from * for each stitch. Always keep your yarn to the back of your work. Plan your design before you start - use washable ink to mark your design (special pens often available at fabric/quilting stores). Just move along one stitch at a time. Be sure not to pull your stitches too tight or your background will pucker and the surface 'chain' won't show properly. To finish off, pull last loop a little longer and bring through to back of project. Run end of yarn through loop and secure. Weave in ends as normal. If you need pictures to help you... here you go. I hope you enjoy embellishing with crochet slip stitch. Pictures or words - anything goes!